I want to start off by saying sorry for the lack of posts lately. I have been very busy trying a somewhat strange hunting strategy. It may be easiest to explain it with the five W’s..
What- digging midtones that other dectorists don’t dig. Why– GOLD– simply put most gold sounds like trash pulltabs or can slaw. Most guys shy away from digging these mid tones. That means they are everywhere (tones not gold rings). This is proven every place I have hunted so far. You can walk for a half hour or hour and only get 1-5 good tones. It maybe a coin or trash that appears as a coin to your detector. Walk the same amount of time and you can dig 30-40 lower perfectly aged signals that are shallow. When I first started hunting I always thought ” if someone else decided not to dig this target, it must be trash”. Now I really question so many targets that I have walked over in my short detecting career. I forgot to add the 6th W- we finally got rain!! This makes deeper signals more pronounced and digging twenty times easier! Wet is good..
Well today was a great finish to a holiday weekend. I started the honey do list at about 11 this morning. My wonderful Dad had helped me build a pergola awhile back.. Ok quite awhile back! Since then my wife and I had been debating how to shade it. We looked at just lattice, awnings, bamboo shades, and practically every other option out there. The other evening my wife brought home 3 potato vines. That meant I needed to give them a ladder and a foundation spot. Today I spent all afternoon building a frame and lattice system for the to take off on. I cant wait to see these things in a couple of years. It should be a great resting spot in the evening! Kolton and I dug up our fine clay/cement yard and planted all three vines in some decent soil. We then blanketed the bed in cypress mulch. Finally I was done and could go detecting! I loaded up and went to a park in Derby Ks. While there kids were playing baseball while elders threw horseshoes. There was a mother swinging gently with her newborn. It was then that it hit me. Many americans doing what they wanted.. The general public had freedom. I am saddened by the lives given for the freedom we have. Everyday we should be thankful for what they accomplished! My hunt was ok but the thoughts I had were more interesting. I only found $.49 but the time in the park doing what I wanted was the real payoff! Happy hunting and thank you for reading! This morning I had the pleasure of hunting with several people from the Friendly Metal Detecting Forum. We hunted an older park in Wichita. I have never found a silver coin in this park. That being said I chose to mainly look for gold. This means digging signals that others don’t… Trash and pulltabs!! I dug my fair share but didnt come up with gold. I snapped a photo of my finds. 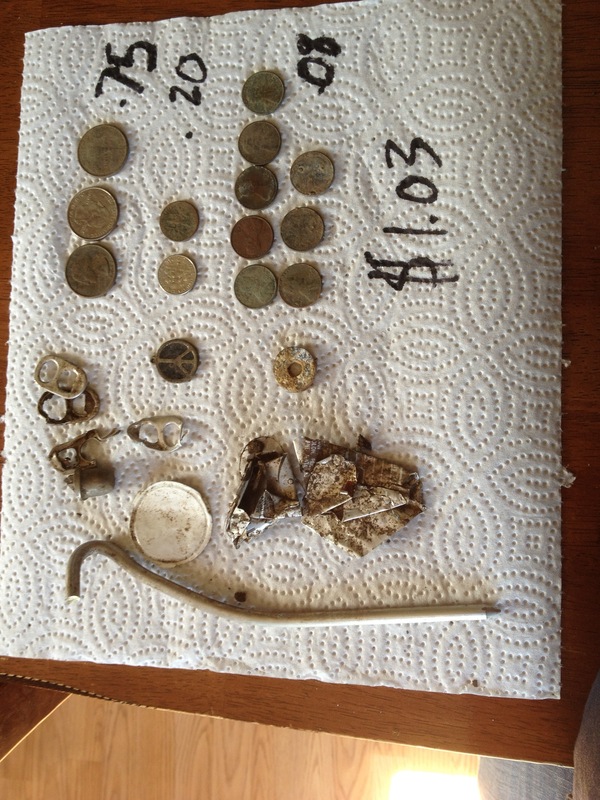 A couple guys found some nice coins including a 1920 wheat penny, a 1916 mercury dime, and an 1890 v nickel. I am sad to say none of them were in my finds pouch. I had the Garrett programmed to find anything from tabs to quarters. Iron and big silver were discriminated out.. Am I crazy for trying so hard on gold?? Or am I the patient hunter that gets rewarded with the yellow precious metal? I know that Pulltab Miner and I have similar thoughts on this but I believe it comes down to amounts of Gold and Silver in the ground. I am guessing that there is less gold than silver overall! Maybe this means I have to dig 10x more junky targets to get a good one. Hopefully when it does hit it makes up for a few missed silver coins.. What are your thoughts?? Thanks for reading this somewhat crazy train of thought! Well this morning was the first day since the beginning of the school year that I don’t have to get kids off to school. That means morning hunts are on. I remember when my wife and I first got married and I would go fishing in the morning before work. Back then we lived close to a decent little fishery. Now I don’t live anywhere near a good fishing spot. But that is ok because I have many many places to hunt enroute to work. That being said I was swinging my Garrett this morning in a public park at 6:15. Here are my reasons for enjoying it. 2- It is cooler in the morning. 3- I can spend all evening with the kiddos and my wife without itching to go detecting. 4- Most importantly, This gives me access to better hunting spots than when I go detecting at night. All in all I am very excited about this! 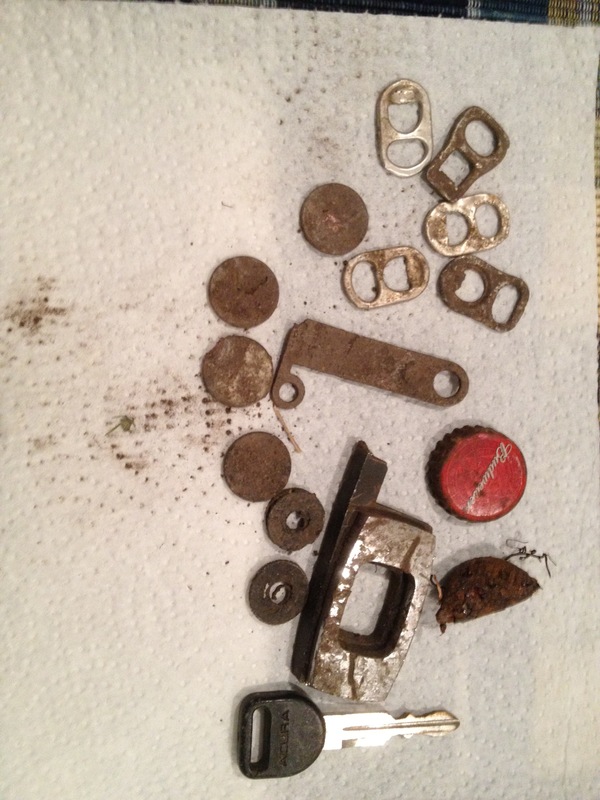 A motorcycle ride and metal detecting in the morning, What else could you want! Today I was out on sales calls and saw a park in Wichita. I had never noticed this park before. A little later I sent PulltabMiner a message asking about the park. He informed me that it had been there since 1900. I didn’t use my break at work today for metal detecting and I had the itch. I left work right at five and headed to the park. I couldn’t spend much time there because two of our boys had baseball games. There were a couple kids there that looked up to no good. I had dug two pulltabs before they headed my way. I saw them coming so I took my headphones off and heard them snickering. Me being me smiled and asked how it was going. They asked what I was doing and told them I was looking for metal. They asked if I had found anything. I quickly tossed them the two pulltabs and said yes. They went on about how boring and dumb it was… Little do they realize. The next target I came across was a Nickle signal with a little Pulltab mixed in. Bouncing between 2-4 inches. I dug a plug and pinpointed dead on center and just a bit deeper. I was giddy like a school girl when I saw my find. 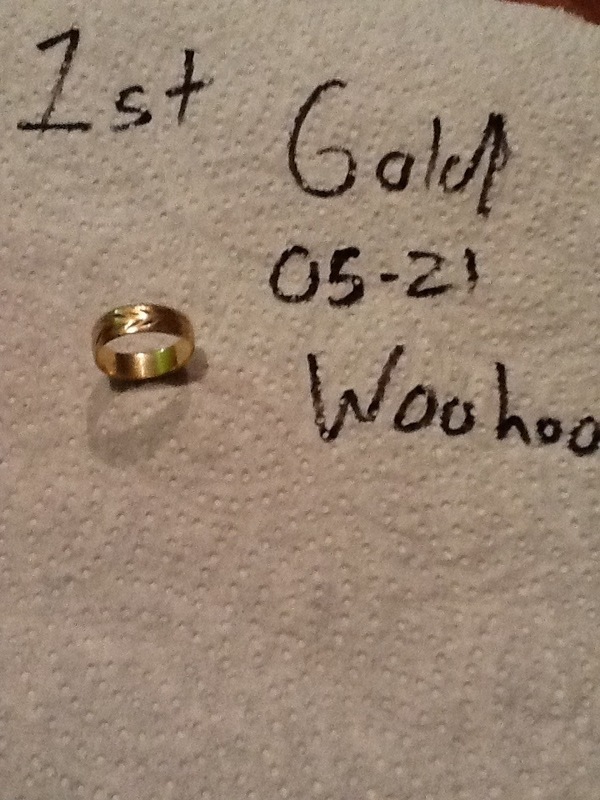 A ring marked14K and makers mark Artcarved… My first gold and I didn’t want to celebrate externally. A quick dash back to the bike and I was gone! The whole way to the ball game I was thinking how mad can my wife be that I’m 5 minutes late because she’ll love the gold. She wasn’t nearly impressed as I was, but did agree that it was cool! Happy Hunting is back again! Well I have to say that I got a fresh breath today in regards to metal detecting. I only hunted the sports fields close to my home. I was primarily looking for clad and jewelry. I hunted for about 2 1/2 hours total in 3 trips. I didn’t find any gold or silver but did find $3.31 in clad as well as a little surprise. During my last hunt I was detecting a different area than the first two hunts. I had plucked $.76 on this trip. The Garrett gave me a nice bell tone bouncing between 4 and 6 inches. I decided to dig. I pinpointed, dug, and retrieved a penny. It was dark but I noticed it was pretty clean. I used the light on my Whites pinpointer and noticed it was a wheatie! I put it into my back pocket and trekked on. I got home and quickly hit it with water and the ol toothbrush. I was pleasantly surprised at what I saw… A fine looking 1915 wheatie. I was even more surprised when I looked up the value of the coin. You can find a general list of wheatie values here. Even though it isn’t a precious metal it was just the kind of find I needed. Happy Hunting and thanks for reading! This morning was such a beautiful morning that I had to get out and hunt some. Since I have changed my focus, I decided to hit the local sports field. I had a decent morning hunting and it was the right way to start the day. After about an hour and a half I went home. I managed to take care of one item on the honey do list. 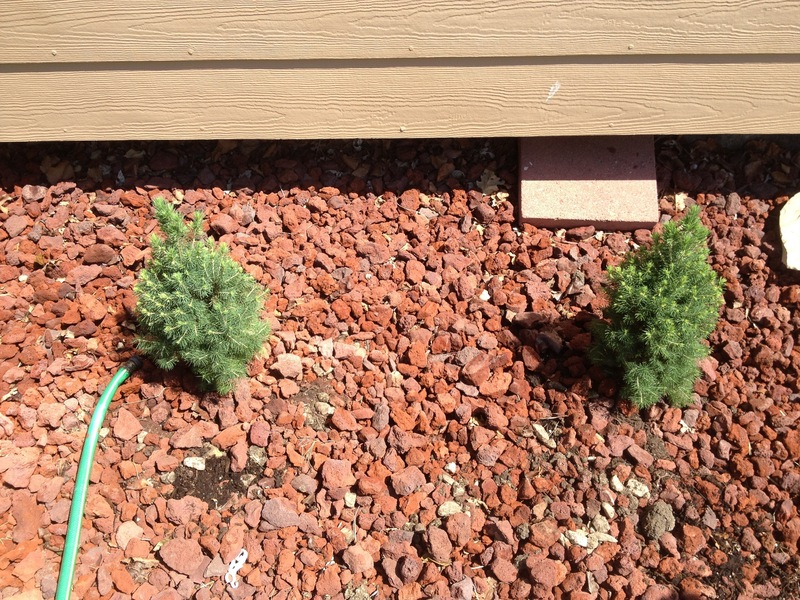 I planted two dwarf spruces in front of the house. It’s days like today that I could stay outside all day! Well tonight I tried a different kind of hunt for big silver. I thought I would go to the older part of Wichita and hunt curb strips in front of businesses. 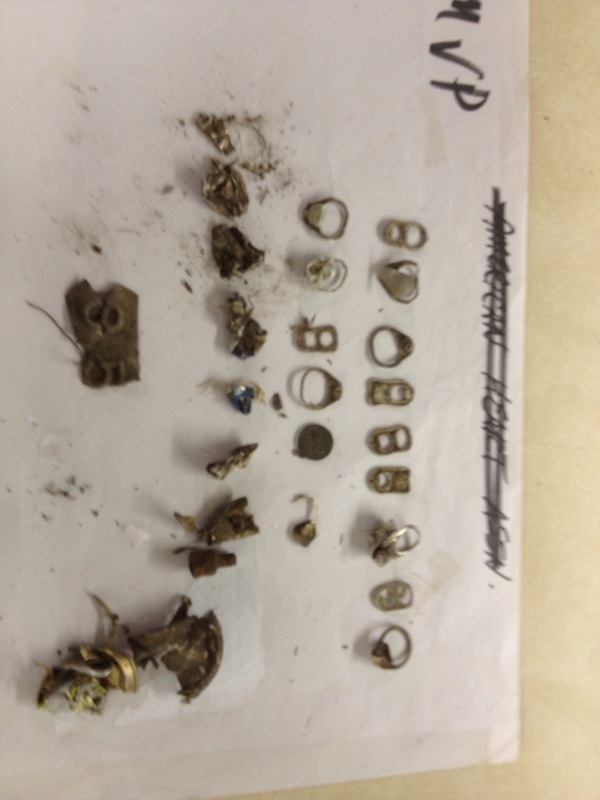 Well my finds are in the picture. My back is really starting to hurt from this constant two week slump I’ve been in. I can’t blame the Garrett Ace because it is doing it’s job. I am just really having issues in hearing which signals I want to dig. I find myself questioning signals that are iffy over 6″ deep. If I hear an iron tone all around an iffy high tone I have been choosing not to dig it. The Garrett gives out a nice belltone on any coin less than 5″ or so. I dig them and there are coins. I am really struggling with those deeper questionable ones in trashy areas. My buddy PullTab and I were discussing the idea that knowing your machine is a very important factor. I’m still learning and the DD coil and new headphones have changed the way things sound. The coil opened up what I would call another layer of targets to perceive. I hope my slump ends soon. The upside is that I enjoyed a great ride in the stormy weather. My favorite time to ride is right before a storm moves through! Well this evening Karson wanted to hit the playground. We did and these were my finds! It was a beautiful evening to be out in Gods creation! The last couple of days have been kind of odd, but very good. On Tuesday I spent several hours in Newton KS. i managed to hunt a park that was established in 1911. This town has some beautiful parks that should produce silver. 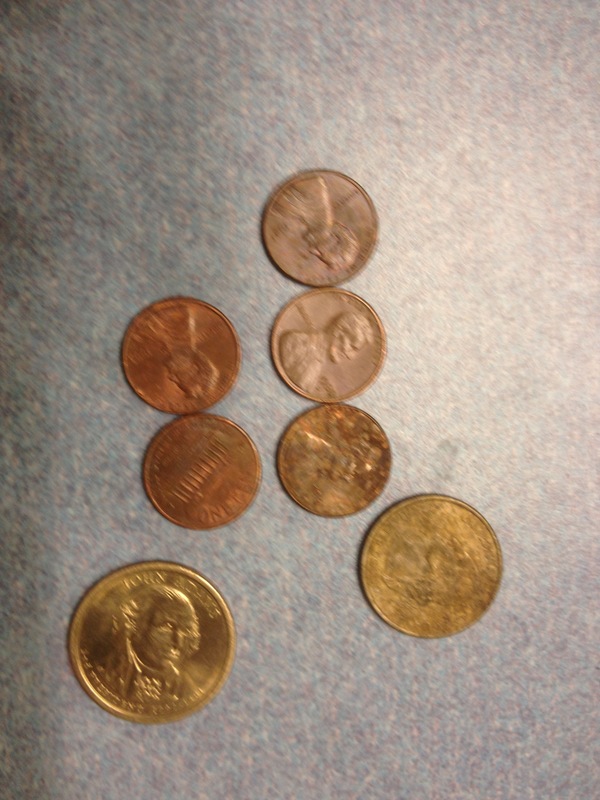 Not for me on this day… I found $.91 all modern money! Today I was on sales calls in several towns west of Wichita. I spent most of the morning in Kingman, KS. While there I hunted a park established in 1903.. Again no silvers. Just modern money from the 1960’s and 70’s. I can’t figure out where the silver is! On the upside I have managed to clock about 200 miles on my motorcycle. Traveling the dirt roads, bi ways, and Highways never gets old. Kind of like mding you never know what you will find. Possibly a $.20 euro in the middle of Rose Hill!